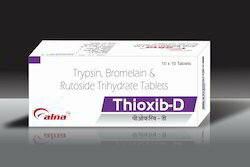 Pioneers in the industry, we offer thioxib -d from India. Packaging Details: It is the combination of Rutoside Trihydrate 100mg+Trypsin 48mg+Bromelain 90mg . Indicatios 1.Osteoarthritis 2.Recurrent respiratory tract infection 3.Pre and post surgically 4.Recurrent urinary tract infections 5.Multiple scleoris.